A conglomeration of several districts, Blaskogabyggd encompasses a handful of settlements totaling around 930 people in southwestern Iceland. 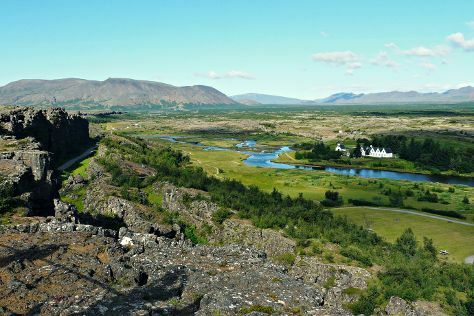 Escape the urban bustle at Golden Circle Route and Thingvellir National Park. Plan a trip to Blaskogabyggd easily and quickly by telling Inspirock to suggest an itinerary. Toronto, Canada to Blaskogabyggd is an approximately 13-hour combination of flight and bus. The time zone difference moving from Eastern Standard Time to Greenwich Mean Time is 5 hours. Expect somewhat warmer evenings in Blaskogabyggd when traveling from Toronto in March, with lows around 1°C. Finish your sightseeing early on the 13th (Tue) to allow enough time to drive to Vik. Iceland's southernmost village, Vik, sports some of the country's wildest and most dramatic coastline. Eschew the tourist crowds and head to Myrdalsjokull Glacier and Sólheimajökulll. Get in touch with nature at Fjadrargljufur Canyon and Black Sand Beach. There's lots more to do: take in the spiritual surroundings of Vik Church, take an in-depth tour of Skogasafn, tour the pleasant surroundings at Reynisfjara Beach, and don't miss a visit to Crashed DC 3 Plane. Traveling by car from Blaskogabyggd to Vik takes 2.5 hours. Alternatively, you can do a combination of taxi and bus; or do a combination of taxi and bus. Wrap up your sightseeing on the 16th (Fri) to allow time to drive to Hella. Hella is a small town in southern Iceland on the shores of the river Ytri-Rangá and has, as of 2011, 781 inhabitants.Hella is situated to the east of Reykjavík on the Hringvegur (Route 1) between Selfoss and Hvolsvöllur.OverviewThe name of the town comes from caves near the river. Get a sense of the local culture at The House at Eyrarbakki and Saga Center. Eschew the tourist crowds and head to Nature & Wildlife Tours and Hekluhestar. There's still lots to do: trot along with a tour on horseback and get impressive views of Southcoast Adventure. You can drive from Vik to Hella in 1.5 hours. Another option is to take a bus. Expect a daytime high around 4°C in March, and nighttime lows around -1°C. Wrap up your sightseeing by early afternoon on the 18th (Sun) to allow enough time to travel back home.